Together this chair and ottoman set make a great update to your living room furniture. The chair is smaller in size and the perfect companion to other transitional living room furniture. 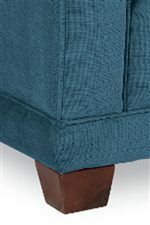 Welt cord trim is used along the cushions of both pieces and the track arms of the chair. Both pieces also sit on finished wood block legs. The ottoman makes for a great place to prop your feet and brings the chair to another level of comfort. Use this chair and ottoman set to update your living room style and create a place to relax. The Kennedy Transitional Chair and Ottoman Set by La-Z-Boy at Conlin's Furniture in the Montana, North Dakota, South Dakota, Minnesota, and Wyoming area. Product availability may vary. Contact us for the most current availability on this product. 240593 Transitional Ottoman 1 27" 24" 19"
230593 Transitional Stationary Chair 1 32" 38" 39"